Former Coventry City goalkeeper signs for Kettering Town. Former Coventry City goalkeeper Michael Quirke has signed for Kettering Town. 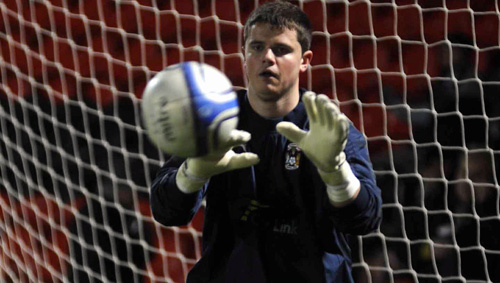 Former Coventry City goalkeeper, Michael Quirke has today signed for Southern League side Kettering Town. Quirke, who graduated through City’s academy went on to make four first team appearances during the 2010/2011 season, impressing the majority of the Sky Blues’ fans, before being let go in the summer of 2011. The 21-year-old, who has played one game for the Republic of Ireland U21’s, has since appeared for the likes of Nuneaton Town, Loughborough Dynamo, Coalville Town, Leamington Brakes and Bedworth United. « Is Chris Dunn the man for Aidy Boothroyd & Northampton Town?